My mom and I left the “black belt” on Sunday, driving from Jacksonville to Atlanta, then flying back to NYC, where my mom has stayed for another week before returning home to Chicago. I was so excited for this trip, anticipating an exciting hunt for new information and uncovered stories. I was also worried that my anticipation doomed me to disappointment. Thankfully, I was wrong about the dooming part. I think it’s safe to say the trip exceeded both my mom’s and my expectations. We now have new details and even some photos that add tremendously to our quest. I’ve shared a few stories in the last couple of posts. So I figured I would just sum up a few things before returning my attention for a bit back to Amsterdam. The primary focus of the trip was on my mother’s family. Although my father’s mother had some roots in Jacksonville, we didn’t really uncover any new information about them while there. We did, however, drive by the site of my grandmother’s childhood home, which, along with many other parts of Jacksonville, looks eerily similar to the way it must have looked in the early 1900s. My maternal grandfather, Pop, has all of his roots in Florida, much of them in Jacksonville. The roots of my maternal grandmother, Nana, go from Georgia to Jacksonville. So our visits to Georgia and Florida benefited both of my mom’s parents. Nana’s paternal grandparents: Lora Hardwick and George C. Harper. I feel like I’ve written endlessly about George C. Harper, the white guy from the wealthy family who had the long-lasting relationship with my 2nd great grandmother, Lora. George and Lora are just fascinating to me. Having read an article in Dawson, Georgia’s weekly newspaper, dated somewhere around 1880, about the evils of miscegenation and the hateful descriptions of the people who engaged in mixed relationships, I can’t begin to imagine their daily struggles as an illegal family. Now don’t get me wrong, black men who only date white women really annoy me. But evil and illegal? That’s taking it a bit far. I wonder what Lora and George looked like, what they talked about, and whether he willingly gave the black children his prominent last name, or if she forced him. Different parts of me want both scenarios to be true. I imagine Lora as quite strong and proud. Although she was “mulatto,” and her children were therefore a quarter black (although I haven’t yet seen his image, my great grandfather describes himself as having blue eyes), Lora raised all of her children to identify as black. Even more, each of the children went on to marry people with dark complexions, including my great grandmother. It may seem like a trivial coincidence. But at a time when black people were given incentive to shun their blackness whenever possible, I have the utmost respect for the pride and the unquestionable identification with black folks of the light-skinned family. But I digress with my black Harpers obsession. My point when bringing them up was to describe the mysterious grave of an infant. When visiting the graves of the white Harper family with cousin Kathy, she pointed out each headstone as if reciting a familiar roll call. But one headstone tripped her up: “The Infant of Mr. and Mrs. G.C. 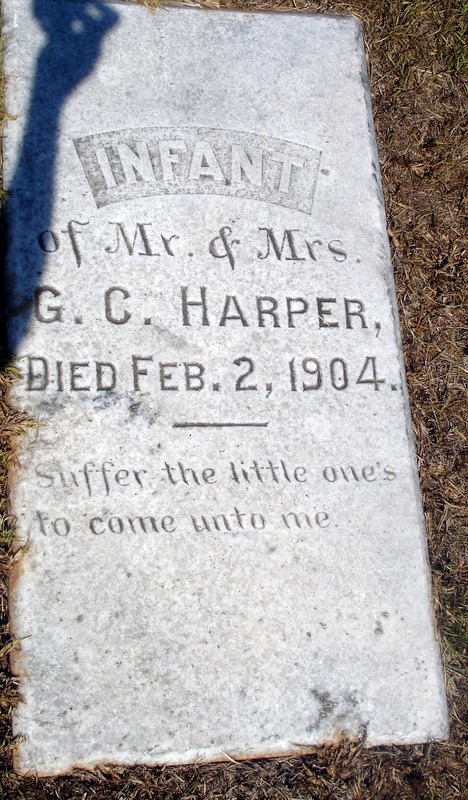 Harper, Died Feb. 2, 1904.” G.C. Harper is white George. And the youngest black child we know of was born in the late 1890s. Could there have been a later-born black Harper who died at birth? And would they have actually listed Lora as “Mrs. Harper” in cryptic fashion? George did later marry a white woman. But they didn’t have any children (this woman lists herself as giving birth to 0 children on the 1910 census). Kathy wasn’t sure who the grave belonged to. I don’t think she had ever noticed or paid much attention to it. But honestly, after spending the morning with her new black cousins, I’m not sure she was sure about anything anymore. After much thought and debate that lasted us until Jacksonville, mom and I agreed that the infant must have been a child born to George’s white wife. The timing just didn’t add up because we’re pretty sure Lora had died by 1904. Sad for George, his white wife, and the infant with no name. And really disappointing for us that we can’t claim a black baby snuck its way into the fancy white cemetery. And one more thing about the Harpers. 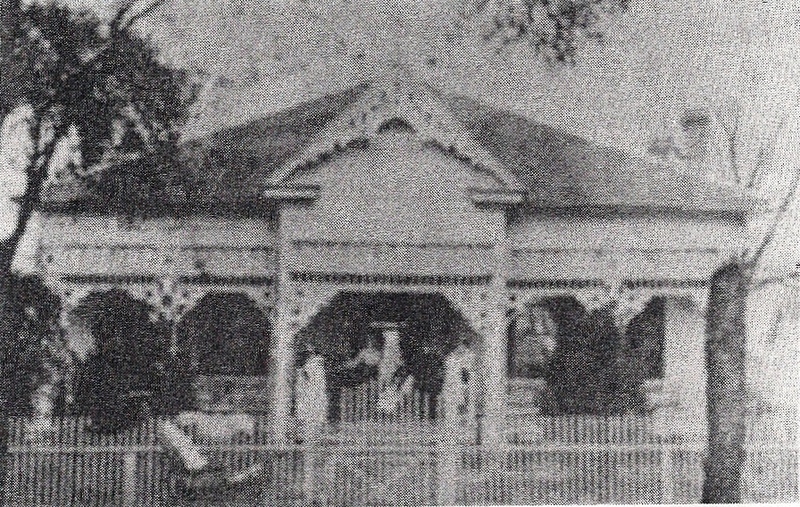 Along with photos of white George’s parents (my 3rd greats), published in a book we found a photo of the original Harper home. It’s super blurry, and difficult to see much detail. But as soon as we saw it, my mother said, “it looks like there’s someone standing on the porch.” You could make out vague figures. But beyond that, it wasn’t worth the eye strain. I scanned the photo after returning home. And after zooming in and perhaps incorporating some wishful thinking, I feel pretty certain I see an image of a black woman holding a white child, alongside other, less distinguishable figures. Lora’s mother, Julia (also my 3rd great) was the cook for the Harpers in the 1880s. And I know they commonly used the black servants to hold the white children in formal family photographs, as sort of invisible props. So it’s not out of the realm of possibility that Julia would be holding one of George’s younger siblings in this blurry image of the Harper family. Or I could be stretching. Either way. The Harper House - do you see her? Nana’s maternal grandparents: Rose and Jim Jackson. Rose (often referred to as Rosa, and also after whom my grandmother was named) and Jim Jackson have been big question marks throughout my research. I just haven’t been able to find either of them on census records as children. And other than a story my great grandmother told my mom as a child about her grandmother, Mary, attempting to escape slavery as a teenager and being caught by a dog, we haven’t had any information about either Rose’s or Jim’s parents. If the Mary story were even true, we didn’t know if she was Rose’s or Jim’s mother. So when arriving in Georgia, I was hopeful that we could get even the slightest bit of information on the Jacksons. 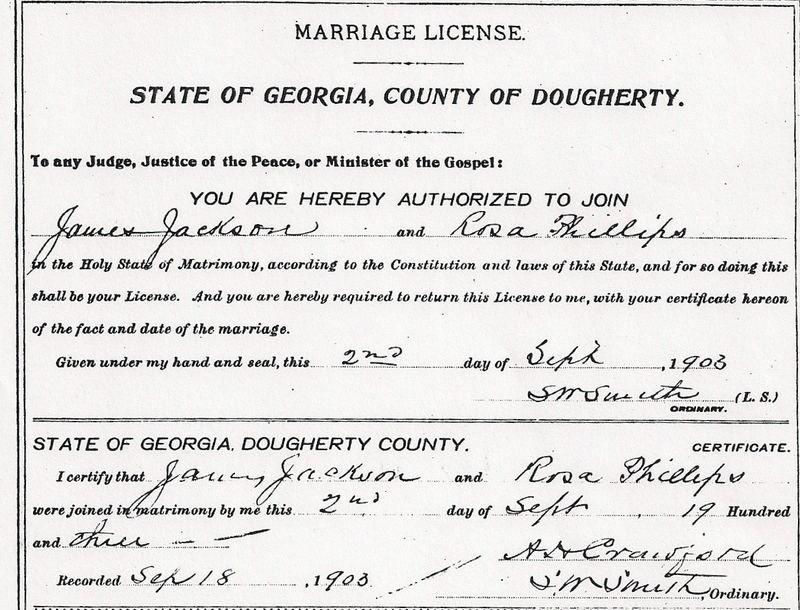 After an unsatisfying visit to the Dougherty County library, we came out with only one real piece of information that very well could have been about other people: a marriage index listing for a James Jackson and Rosa Phillips. The marriage date was several years after my great grandmother’s birthday, so I at first dismissed it. But my mother verified that she knew they were indeed married years after their children were born (the scandal!). Worth looking into, but beyond going to the courthouse, there was no way to be sure this record was for my ancestors. Fast forward to the Dougherty County Probate Court. They were able to pull the marriage certificate, which didn’t provide much more information than the index. But the trick was requesting each of their death certificates. Although death certificates are unpredictable with regards to the amount of information they include (it depends on how much the informant knew at the time of death), we were prepared to pay $25 for each certificate, if only for a hint of any new information. Not only did the nicest woman in Albany, GA return with two completely filled out death certificates, with all four of their parents listed, but she didn’t charge us a cent because we were requesting the information for genealogy research…”I’m not gonna charge ya for these copies.” Once I got over the emotion caused by her kindness, I teared up over the names of an entirely new generation of my great grandmother’s family – her grandparents! Jim Jackson was a junior, as his father was Jim Jackson, Sr. His mother was Mary Gilbert, which verifies the story about a Mary, and explains why my great grandmother’s brother’s name was Gilbert. Rose’s parents were Dinah and Martin Phillips, verifying that her maiden name was indeed Phillips and we had located the correct marriage certificate. And if these discoveries weren’t enough, we went back to the hotel to look at earlier census records, finding Jim Jackson as a child, living with his parents…and his grandfather, Miles Jackson! That makes Miles my 4th great grandfather. It’s almost too much, yet never enough. Pop’s maternal grandparents: Laura and Alexander Brooks. Okay, these two still remain somewhat of a mystery. Although Pop’s father’s family has taken me to a Zulu ancestor, his mother’s family has been harder to trace. It was only earlier this year that I learned Laura and Alexander’s names after finding them on the census, living with my great grandmother who was a young girl at the time. Beyond that, I’m stuck. While in Jacksonville we were able to narrow down the years of each of their deaths by going through public directories and seeing when they were no longer listed. But then I couldn’t find either of them listed in the local death index. They died years apart, yet they are equally impossible to find. I just have to keep trying. What I have learned throughout this process is the information is there…somewhere…waiting to be found. And the ancestors certainly want to be found. Some details may just be a bit more difficult to uncover, perhaps a bit dusty, or maybe even lacking sufficient pixels to make anything out. But trust that none of these challenges will stop me from digging. Every day it becomes more and more important to give names to my ancestors, making sure they know their lives and their legacies have not been erased or forgotten. I owe them at least that much. Dana, forget writing a book – you should go right to the big screen with this. You’re a straight-up genealogical star! Aw, thanks Jeremy! I’ll give some thought to the movie suggestion. My main consideration: who will play me? I have LOVED reading about your journey to the south. You’re doing your ancestors such an honor by being so committed to finding out their names, lives, and histories. Kudos!!! Can’t wait to see you next week and hear more in person! Your recent obsession with finding out about your history, and I use recent loosely, reminds me of something that I wrote about two years ago. I just found this blog and your search for your roots is fascinating. Here is what I wrote; http://roundtable84.wordpress.com/2008/02/28/the-twoness/ I would like your input and I intend to continue the conversation on the topic.